Do people behave differently when they think they are being watched? When former National Security Agency contractor Edward Snowden revealed the mass surveillance of American citizens in June 2013, the question suddenly grew in importance. Can the behavior of an entire population, even in a modern democracy, be changed by awareness of surveillance? And what are the effects of other kinds of privacy invasions? Jon Penney was nearing the end of a fellowship at Harvard Law School’s Berkman Klein Center for Internet & Society in 2013, and he realized that Snowden’s disclosures presented an opportunity to study their effect on Americans’ online behavior. During research at Oxford the following year, Penney documented a sudden decline in Wikipedia searches for certain terrorism-related keywords: Al Qaeda, Hezbollah, dirty bomb, chemical weapon, and jihad, for example. More than a year later, when the study ended, such searches were still declining. “Given the lack of evidence of people being prosecuted or punished” for accessing such information, Penney wrote in the Berkeley Technology Law Review (which published his research last June), he judged it unlikely that “actual fear of prosecution can fully explain the chilling effects suggested by the findings of this study.” The better explanation, he wrote, is self-censorship. Although Snowden highlighted government surveillance, it may not be the worst problem. Corporations hold vast and growing troves of personal information that is often inadequately protected, its use largely unregulated. Since 2005, hackers have stolen hundreds of millions of credit-card numbers from major retailers such as Target, Home Depot, TJX, and eBay. In 2014, someone stole the keys to half a billion Yahoo accounts without being detected. And everyday threats to privacy are so commonplace that most people are numb to them. In exchange for free email, consumers allow companies such as Google to scan the content of their digital messages in order to deliver targeted ads. Users of social media, eager to keep in touch with a circle of friends, rarely read the standard agreement that governs the rights and use of what they post online. Smartphones know their owners’ habits better than they themselves do: where and with whom they sleep, what time they wake up, whom they meet, and where they have been. People accept such tradeoffs in exchange for convenience. They don’t really have a choice. 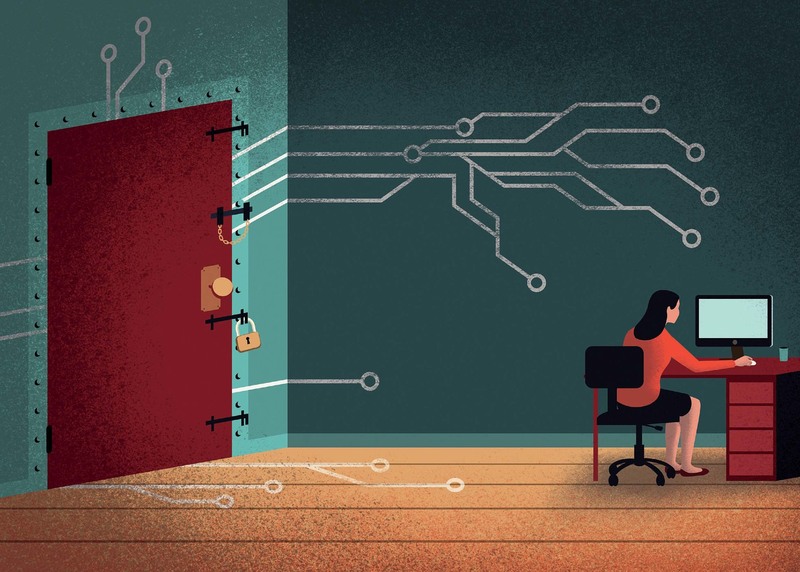 The perception that the Information Age has put privacy and security at risk is widespread. Necessarily, the search for solutions is equally broad-based. In Washington, D.C., Marc Rotenberg ’82, president and director of the Electronic Privacy and Information Center (EPIC), seeks legal solutions to privacy problems (see page 60). At Harvard, research into privacy and security is focused at the Berkman Klein Center; at the Paulson School of Engineering and Applied Sciences’ Center for Research on Computation and Society; at the Kennedy School’s cybersecurity program; at the Institute for Quantitative Social Science’s (IQSS) Data Privacy Lab; and also within the schools of medicine and public health (and at the affiliated hospitals), where researchers seek to protect patient data so that it can be shared appropriately, particularly in the case of rare conditions. Solutions to privacy and security problems thus involve computer scientists and legal scholars, as well as experts in healthcare, government, and business. In the past 15 years, entire corporations, even nations, have found their data and systems vulnerable to attack. The intrusion at the U.S. Office of Personnel and Management, disclosed in April 2015, was reportedly the most significant breach of federal networks to date: hackers, thought to be state-sponsored, took personal data for four million employees and political appointees, leading to the recall of American intelligence agents posted abroad. The 2016 digital break-in at the Democratic National Committee’s headquarters was like a modern iteration of Watergate, but initiated by a foreign power seeking to interfere in the presidential election. That Cyber Command is charged with protecting the Defense Department’s weapons systems, millions of computing devices, and more than 15,000 data networks (say, in support of network operations for a battalion in Afghanistan fighting the Taliban). It also provides offensive cyber capabilities to commanders around the world in the event that hostilities break out (analogous to the access they have to air and sea power capabilities). And it is responsible for defending the nation—including aviation, financial, and power-transmission systems—against a significant cyberattack. Furthermore, says Benkler, systems built in part with “free software developed by communities that don’t have the imperatives either of profit-making companies, or of dealing with the tensions between rights and the state of emergency, get better as their vulnerabilities are constantly probed, exposed, and then corrected in a constant, evolutionary, back and forth.” Such robustness is obviously desirable. In the here and now, using encryption, firewalls, and passwords is one way to keep information secret. But secrecy is just “a very small slice” of what privacy is about, says Marc Rotenberg of EPIC. Through “creative advocacy, litigation, and public engagement,” the Washington, D.C.-based nonprofit aims to shape policy and advance the legal framework for safeguarding personal liberty. Rotenberg, an attorney and adjunct professor at Georgetown University Law Center, has won cases before the Supreme Court, filed numerous amicus briefs, testified before Congress, and given awards to leading privacy advocates across the political spectrum. EPIC brought a petition to the Supreme Court arguing that the Foreign Intelligence Surveillance Court had exceeded its legal authority, and a broad coalition of legal experts and former members of Congress joined the campaign. But the Court did not rule on the merits of the petition. “That was after the Solicitor General twice sought extensions,” Rotenberg explains, “which gave the foreign intelligence surveillance court enough time to issue an opinion justifying the program. We call that just-in-time lawmaking.” The EPIC petition nevertheless marked the beginning of a broad bipartisan coalition to pass legislation, the USA Freedom Act of 2015, ending the NSA’s bulk collection of such information. On the corporate front, EPIC brought the complaint that forced Snapchat, the photo-sharing service, to fulfill its promise to delete images. When Google tried to move all Gmail users onto Buzz, its social-media platform, EPIC complained to the Federal Trade Commission (FTC), and established a significant precedent for Internet privacy. When WhatsApp announced that it would share users’ secure-message data with Facebook (which had recently acquired the company), EPIC intervened. Likewise, when Facebook started changing user privacy settings after consumers had set them, EPIC brought the matter to the FTC, which stopped the practice. Most recently, EPIC has been active in the discussion over how student data are collected and used. EPIC also studies diverse privacy laws to advance legal protections. A project begun in 2015 to identify states with the best privacy laws examines data security and breaches, drone surveillance, police body cameras, and student privacy, to name a few. EPIC considers Massachusetts’s 2007 data-protection law one of the best in the country; California has crafted very good data-breach-notification regulations. Farther afield, Rotenberg admires the European Court of Justice’s decision on the “right to be forgotten,” which involved personal bankruptcy records that had been published in a newspaper 10 years earlier. The Spanish plaintiff asked both the newspaper and Google to remove the records. Spain’s privacy agency decided not to touch the newspaper, but ordered Google to remove the record from search results—drawing “a very thoughtful line” between the protected free expression of news organizations and the commercial operations of data brokers, who commodify personal information. One computer scientist , famous for her work on privacy technology and re-identification of anonymous subjects in large data sets, approaches this problem as a technologist, seeking to expose the inner workings of algorithms in ways that make them susceptible to existing laws. Google seemed to think professor of government and technology in residence Latanya Sweeney might have an arrest record. A simple search for the name of this African-American computer scientist, now faculty dean of Currier House, yielded ads implying that she had a criminal past. When former Reuters reporter Adam Tanner, now an Institute for Quantitative Social Science (IQSS) fellow, suggested that resulted from her “black-sounding name,” Sweeney at first resisted his explanation. Then she discovered that a search for “Latanya” turned up images of black women, and a search for “Tanya” turned up images of whites. She decided to dig deeper. Because she runs Harvard’s Data Privacy Lab, based in IQSS, Sweeney has resources to find out what makes an algorithm tick. Using lists of first names given more often to black babies than to white ones, she Googled the names of real people from Internet addresses around the country, capturing 100,000 ad impressions. For some names, ads implied the existence of an arrest record as much as 80 percent of the time, even when there was none. “Blacks are a protected group. Employment is a protected setting,” she notes. If an employer Googles an applicant’s name and ads pop up implying that there is an arrest record, she says, that is enough to trigger a federal discrimination investigation. Her work showed, Sweeney says, that these unforeseen consequences can be studied and the results used “to empower the government structures we already have for oversight.” Rather than demanding new laws that focus on new technologies, she used science to expose the workings of technology, so existing law could be applied. Armed with this tool for “algorithmic accountability,” Sweeney took a year’s sabbatical in 2014 to work as chief technology officer at the FTC. The commission had lacked pertinent technological expertise to investigate the issue; Sweeney’s presence persuaded the chairwoman to hire additional technologists. Shoshanna Zuboff, the Wilson professor of business administration emerita, would agree. She thinks about the information landscape in economic terms and says that there is even more at stake than privacy. Zuboff says that corporate use of personal data has set society on a path to a new form of capitalism that departs from earlier norms of market democracy. Targeted ads—about which consumers already express concern—are the beginning of a much more ambitious program of modifying and influencing behavior toward profitable ends, Zuboff argues. “No one ever said mass production was only for automobiles, and surveillance capitalism isn’t only for advertisers.” There are many other companies and industries, she says, that want to participate in the new behavioral futures markets. Early examples include sectors such as insurance, retail, and health. The stakes are getting higher. She points to the wildly popular game Pokémon Go, which rewards players with virtual experiences. “I can send you to the dry cleaner, I can send you to the car mechanic, I can send you to the restaurant—anywhere I want to with this reward system. All these entities pay to play in the new marketplace for behavior.” Even before the game launched in Japan, McDonald’s had paid to designate its 3,000 restaurants as destinations (called “gyms”) within the game. The game’s developer is Niantic, formerly a lab within Google run by John Hanke, who also led Google’s geolocation services. (The core mapping technology was funded by the CIA’s venture-capital arm.) Having mapped a virtual world onto the physical one with Google Maps and Google Earth, use of smartphone location services closes the loop, populating that cyber domain with people in the physical world. At the moment, the project is “allowing the public to get exposed to this kind of interaction, and become habituated to it,” says Zuboff. Pokémon players have fun, without realizing that it is also another form of social and economic control.